This bird is really so common in urban India that we avoid taking its pictures. I shot it today morning since I had nothing else in view worth taking a nature picture. The common myna/Indian mynah (Acridotheres tristis), sometimes spelled mynah, also sometimes known as "Indian myna", is a member of the family Sturnidae (starlings and mynas) native to Asia. An omnivorous open woodland bird with a strong territorial instinct, the myna has adapted extremely well to urban environments. Perfect timing to capture the moment. Lovely color & details along with that fabulous catchlight on the eye. Superb! The bird is well placed in the frame. 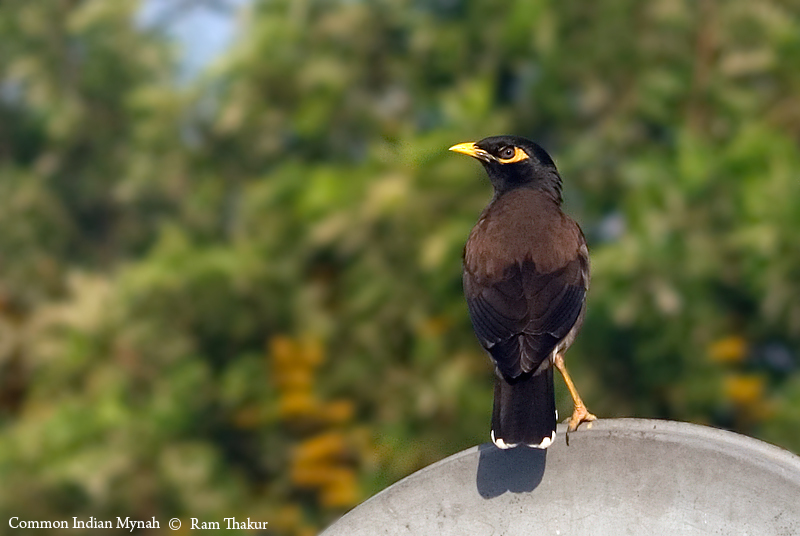 The point of view is shopwing the details of the Common Indian Mynah. The eye contact with the bird is great. Have a nice day.